The U.S. Solar Market Insight 2018 Year-in-Review Report from Wood Mackenzie Power & Renewables and the Solar Energy Industries Association (SEIA) mostly showed the initial uncertainty / impact of the tariffs on utility-scale and non-residential solar and how the future is super bright going forward in general (doubling capacity in the next five years). But the big positive in 2018 came in the stabilization / maturation of the residential market. While annual growth fell in both the non-residential and utility-scale solar sectors, residential solar growth stabilized in 2018 after the previous year’s contraction. 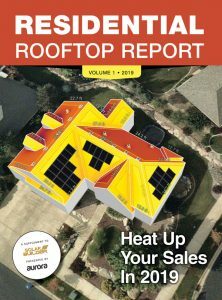 After a year in which residential solar experienced 15 percent contraction, 2018 marked a year of rebound as the market grew by 7 percent. Q4 was the largest quarter for the residential solar segment in two years, a sign that the residential market is stabilizing. 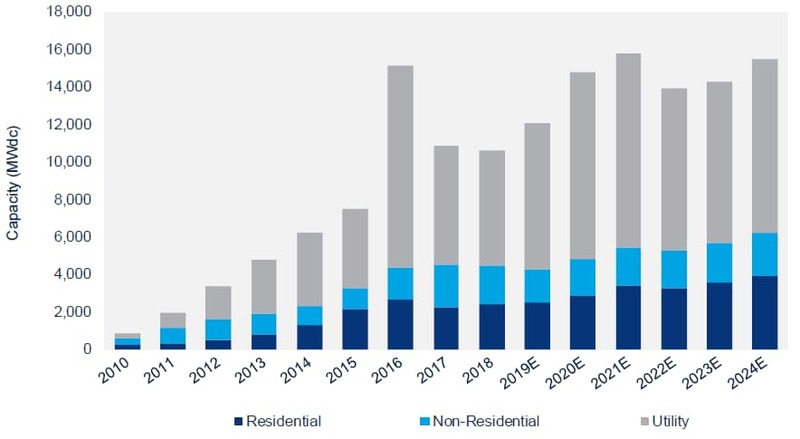 In total, 314,600 new residential PV systems were installed in 2018. The U.S. residential solar market has now seen five consecutive quarters of modest growth, and the fourth quarter of 2018 was the largest quarter for residential solar in two years. Of the top 10 markets in 2017, six markets experienced annual contraction in 2018 while two experienced double-digit percentage growth. Meanwhile, a handful of states are leapfrogging developed markets. Texas and Florida, two states with generally low solar penetration, stood out in 2018, adding more capacity than some of the highest penetration states, like Maryland and Massachusetts, signaling new state-level leadership on residential solar development. “In 2018, we saw a pivot away from legacy, incentive-driven markets and the emergence of low-penetration markets with limited third-party ownership options, good PV resources, and low electricity rates – a trend we expect to continue,” the report states. The other standout note is the diminishing power of net metering rules to influence the market. Up till now, any changes to NEM or rate structures would have created “demand pull-in,” but despite anticipated changes to incentives and NEM in 2019-2020, the major Northeast markets collectively saw no growth in installation volumes.